Housing providers and their agents, including building managers and staff, play a crucial role in establishing a culture where bullying behavior is not acceptable. According to Paul Votto, President of the National Association of Building Managers, “Bullying is bad for business.” Maureen Duffy and Len Sperry, experts on workplace mobbing, an extreme form of bullying, show that mobbing can best be addressed through organizational development. Attracting and motivating employees enables a healthy workplace culture, according to Andrew Faas, and this pays off in income, profits, productivity, and the value of the enterprise. This is even more important for non-profit and governmental organizations, especially when they face the challenge of balancing a tightening budget. Harassment is comparable to bullying, and creates risks, increases exposure, and potential legal costs for the housing provider and their agents. Legal liabilities pose a significant hazard of civil suits by aggrieved individuals or by state or federal agencies. Insurers are recognizing that a housing provider can be held liable for damage caused by bullying. The office of Gustavo Velasquez, HUD Assistant Secretary, Office of Fair Housing and Equal Opportunity, presumes that the housing provider is liable for harassment, either harassment by their agents or that takes place among tenants. That office has published a final rule effective from October, 2016, that will guide housing providers and their agents to ensure the rights of all persons protected by Fair Housing Act. A good place to start in preventing bullying in housing developments is for housing providers to create a positive and healthy workplace culture. A positive workplace culture has been shown to reduce absenteeism, improve employee wellbeing, performance and retention, which ultimately results in reduce costs. It also creates a culture that is more likely to take complaints of harassment and bullying seriously and deal with this sort of problem quickly. The longer bullying and harassment is allowed to continue, the harder it will be to get it stopped..
Duffy, Maureen and Sperry, Len. Mobbing: Causes, Consequences, and Solutions, (New York: Oxford University Press, 2012). Duffy, Maureen and Sperry, Len. Overcoming Mobbing: A Recovery Guide for Workplace Aggression and Bullying, (New York:Oxford University Press, 2013). 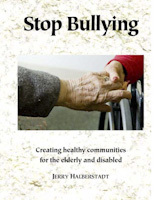 Halberstadt, Jerry, Stop Bullying: We can create healthy communities for the elderly and disabled (Peabody, MA:Togethering Press), 2017. Fass, A. The Bully’s Trap: Bullying in the Workplace ,( Mustang, OK: Tate Publishing, 2015). HUD is taking complaints of harassment of tenants who fall into a protected class seriously—and bullying is covered under HUD’s definition of harassment. When harassment is pervasive in housing, this can constitute a ‘hostile environment’ and HUD can potentially get involved. Bonny Zeh, a research associate with the Stop Bullying Coalition, with assistance from Jerry Halberstadt, Coordinator of the Stop Bullying Coalition has assembled these helpful resources. The Stop Bullying Coalition has no control over the nature, contents or availability of the web sites listed. The inclusion of a link on this page does not imply recommendation or enforcement by the Stop Bullying Coalition. This list will be updated on an ‘as needed’ basis.